We want to ensure you get the best possible experience from our service, here at the most common artificial grass frequently asked questions in San Diego. To deal with common questions that we are asked, we’ve put together this FAQ page. If there’s anything else you need to know, just get in touch, and we’ll be happy to help! Q:What exactly is artificial turf? Artificial turf is just what it sounds like- a grass-like substance used in places where grass won’t grow, or to lower the maintenance costs of regular grass lawns. It stays green all year round, making it an increasingly popular choice among homeowners. Q: What does artificial turf consist of? Artificial turf is made from flexible grass blades that resemble natural grass. Most artificial turf systems consist of a multi-layered backing system and they also include a drainage layer. These features allow for the long durability of the turf due to the uniformity, resilience and stability. Q: Is the newer generation of artificial turf better than the turf of the past? Definitely. Rubber and sand infill were used in the first artificial turf systems after 1990. In comparison to the systems of the 1960’s, the newer systems were improving player performance and safety. The systems of today integrate the features the resemble natural turf which in turn give the benefits of low cost maintenance, extra revenue generation, safety and increased frequency of usage. Q: Is artificial turf environmentally friendly? Very. At present, over one million gallons of water are saved annually thanks to synthetic turf. To increase this amount, many local governments offer tax credits and rebates to motivate homeowners and businesses to make use of artificial turf. It also eliminates the need for pesticides and fertilizers. Q: How safe is artificial turf? Very safe. There have been numerous worldwide studies that have proven the safety of artificial turf, so there’s nothing for you to worry about. Q: What makes San Diego Artificial Grass special? San Diego Artificial Grass is, quite frankly, the best kept secret in artificial turf in San Diego. We have an enormous selection of artificial turf available, and, thanks to our low overheads, pass on our savings directly to the customer. We are happy to work within any budget, and will tell you just what you can get for your money. Q: Will artificial turf overheat? While some synthetic turf has been reported as heating up quicker than regular grass, it’s nothing a little hose down won’t sort out. Q: Does water drain well from artificial turf? Yes. Many of our systems have an integrated drainage layer and it also has flexible durable blades. These allow for the water to drain away with ease and in turn will not damage the turf. Q: Can turf be used over cement? 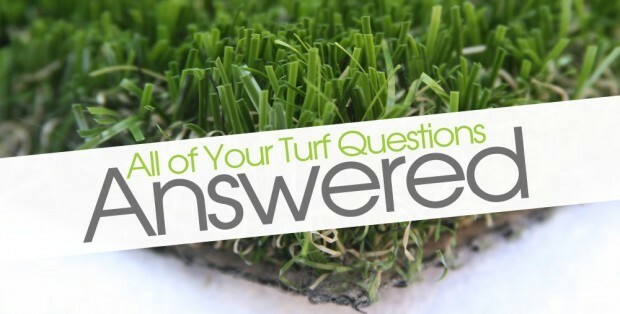 Q: When can you install my artificial turf? Whenever you want! We have an enormous amount of artificial turf in stock at all times. Q: Do you deliver the turf? Yes. Tell us where you want it delivered and we will make sure it gets there. Q: Will you install it for me? Certainly! We’ll be happy to install the turf for you upon request. Q: What makes you better than all the other companies out there? We only use the very best artificial turf, to guarantee your satisfaction. We also have our turf constantly in stock, to get the job done for you quicker, as well as offering professional installation and delivery services whenever you need them. Q: Would I be able to choose the rolls that I want? Yes. If the turf rolls are easily accessible you can choose them as you wish. Q: Do large volume purchases include a discount? Yes. We can issue a discount. Q: Can I install the artificial turf myself? Certainly! Our synthetic turf is a snap to install, and we will be happy to advise you about doing it yourself- just get in touch for more info. Q: Can I remove the artificial grass myself if necessary? Yes. Our grass is deliberately designed so that you can remove it should you need to. Q: What does crumb rubber consist of? When tires are recycled, one of the byproducts is what the turf industry calls crumb rubber. It is used for its flexibility and resilience on turf fields. It is durable and easily maintainable which makes for a safe playing surface for everyone. The tire’s fiber and steel components are removed altogether during the recycling process. Q: Is crumb rubber safe? Yes. Crumb rubber infill is a safe approved infill option for artificial turf fields. It has been safely used on tracks and playgrounds. Science has proven that there are no health risks associated with its use and it has been extensively examined over that past 20 years. Therefore, it gives you peace of mind that it is safe for all ages. Q: What are the different uses for crumb rubber? The sky’s the limit. It can be used to make exercise mats, floor tiles, turf grass, car bumpers and much more. It has endless applications which may be practical or complex. Q: Is artificial turf safe to play on? Of course! Parents report few to no injuries from playing on artificial turf, and it’s a great choice for kids with grass and pollen allergies. We work hard to meet all necessary safety requirements with all our synthetic turf products. Q: Isn’t it dangerous if my kids ingest the turf? Not in the slightest. All our turn is non-toxic, and what’s more, it’s antimicrobial, so that germs don’t breed in your lawn- making it even safer than natural turf. Q: What happens if my children ingest crumb rubber? Of course, our advice is to avoid ingesting crumb rubber. But, if this accidentally happens you don’t have any reason to worry. Studies show that ingesting and swallowing crumb rubber is not a serious health risk. Q: Is artificial turf safe for my pet? Absolutely! We find that most of our customers are pet owners, looking for a way to avoid pet urine ruining the look of their lawn. It’s simple to clean up after their mess, and they won’t dig up your hard work. It’s the perfect solution! Q: Won’t the pet urine ruin the artificial turf? Artificial turf makes a great alternative to rock or concrete because it fully neutralizes pet urine. It’s simple to clean up any other messes, too, in just the same way that you would with natural grass. Dogs typically don’t feel the urge to dig up synthetic turf, but should they do so, any damage can be easily repaired with little fuss. Q: How do I clean up pet mess on artificial turf? Just pick up any solid mess, and then hose down the turf. You should hose down any places where your pet typically urinates once a week. By regularly cleaning it, there shouldn’t be any lasting smell. We hope that we have addressed your questions on this page. However, if there’s something else you’d like to know, then just get in touch- we’ll be happy to help! To get your free estimate today, or if you have any questions about our great service, contact the professionals at the best artificial grass and synthetic turf installation company in San Diego.